Alan Neigher from Westport Connecticut works as Attorneys, Civil Law Attorneys, Entertainment & Sports Lawyers, General Practice Lawyers, and Intellectual Property Lawyers. Feel free to contact us at the following contact information. 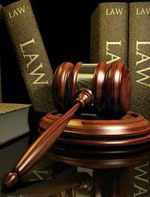 Civil Law Attorneys: Many states in the world have comprehensive legal systems called civil law jurisdictions, largely inspired by Roman law, the primary feature of which was that laws were written into a collection; codified, and not determined, as is common law, by judges. Germany and France sustained the bridge between Roman law and civil law (old French law book cover pictured). Civil law jurisdictions purport to provide all citizens with an accessible and written collection of the laws which apply to them and which judges must follow. Miller, Hamilton, Snider & Odom, L.L.C.